In the 40th year since its founding by Father Mike and the second year since his passing (December 14, 2016), Wordnet Productions has begun an exciting Legacy Campaign to “run with the Word.” (Psalm 147:15) Won’t you “run” with us as we move into the new future! Expand the Programming! Wordnet programs past, present, and future plus those of many other inspiring Catholic producers, are now being shown on our own web channel, WNTV, “WordNet Television.” Or you can explore WNTV at our new website www.wordnettv.net. 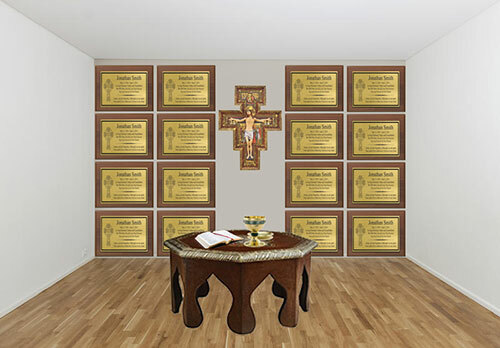 Legacy Room which presents Wordnet’s amazing story and the living legacy of Fr. Mike, with a Memory Wall of loved ones’ photos commemorating donations made in their honor to the Legacy Campaign. These special people will be remembered at the weekly celebration of Eucharist. then make your gift toward the $329,000 today! You can make one time gift or a pledge of any amount. With your support, there’s no limit to Wordnet’s possibilities! Wordnet Productions appreciates your generous donation. Thank you for becoming a partner with us in spreading God’s word around the world. Please know that 100% of the donation will go toward the expenses of the production of our regular programs and the studio. We are a 501(c) (3) nonprofit organization.